One of the most enjoyable benefits of motorcycling is the freedom of riding in the open air. That’s certainly what Cody Carson enjoys about it– that, and the chance to not have to think about the worries of the day. What he does think about, however, is motorcycle safety. Cody would never dream of riding without his protective gear and helmet. 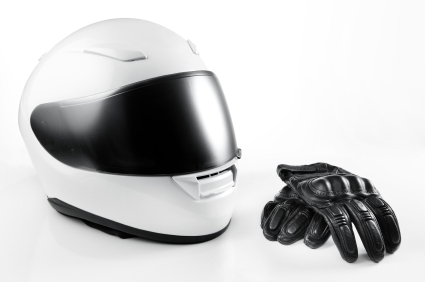 He knows first-hand that protective gear can save your life during a motorcycle crash. While in nine years of riding, Cody has never been in a crash, his brother has. Wearing both a helmet and protective gear allowed his brother to survive his motorcycle accident with only a minor concussion. Recently, Cody was the subject of a motorcycle safety video produced by the Colorado Department of Transportation. The video simulates the abrasions, burns, and broken bones that can be sustained in a motorcycle crash if the rider is not wearing protective gear. Protective gear has two basic purposes: comfort and protection. Properly fitting gear will help you stay comfortable when encountering various riding conditions. In the event of a crash, protective gear will help prevent or reduce injuries. The most important piece of protective gear you can wear is a helmet. This was emphasized in the University of Southern California researcher, Harry Hurt’s federally funded study, Motorcycle Accident Cause Factors and Identification of Countermeasures,” also simply called “The Hurt Report”. Researchers in this well-accepted motorcycle study performed in-depth, on-scene investigations of motorcycle crashes and analyzed thousands of motorcycle crash police reports. This and other research has established that helmets save lives by reducing the occurrence of head injuries. Thousands of people are injured in motorcycle crashes every year. Trauma surgeon, Pat Offner, sees hundreds of motorcycle crash victims every year. He says there is definitely a difference in the severity of injuries between riders who wear protective gear and those who do not. Perhaps the biggest difference is the severity of brain injuries. The motorcycle lawyers at Russ Brown Motorcycle Attorneys love riding, connecting with our fellow riders, and introducing more motorcyclists to BAM, our free roadside and legal assistance program. If you are interested in learning more about BAM or our law firm, call us at 1-800-4-BIKERS or visit us on the web at www.russbrown.com. We Ride—We Care—We Win! I was involved in an accident in 2011, thanks to my full-face helmet I still have a face, thanks to my approved back-plate I am not an invalid and thanks to the approved pads in my approved motorcycle clothes I walked away a few minutes later with no more than a few bruises. My gloves were destroyed but I received no injuries to my hands, my leather jacket and pants received damages but none on my body other than a large bruise on my hip, which has now heeled. My left approved motorcycle boot received some damages too, but my foot none. Yea some days are really hot, and one sweat as if one is in a sauna with all this gear on but I literally speaking walked away from an accident thanks to all my protective gear that without it would have rendered me paralyzed or dead. All the protection-gear that I wear are important but none as essential as my back-plate and my helmet.